I'm sorry I didn't write on Saturday. Things got away from me. I had a Toastmasters thing in Dartmouth in the morning. I had arranged to meet up with a woman whose father was a member of my club, back in the 1980's. He died suddenly. More on that later. And after he died, the family gave one of his paintings to our club. But I'm getting ahead of my story. For many years, up until 2005 or so, we gave out the "Al Riggs Award" to the member of the club who best exemplified the spirit of Toastmasters. The recipient would get to keep the painting for a year before returning to the club so it could be awarded to someone else. I don't know how it was done before I joined, or for several years afterward, but we eventually developed a point system, one that excluded members of the executive, because the executive was the ones who gave out that painting, every year. One year, around 1995, the recipient of the Al Riggs award/painting was a man who up and moved to British Columbia, I think it was. We barely got the painting back from him before he left town. I think we had other close calls over the years. Eventually, our club membership began to suffer, to the point where there might be only two or three or four club members who were not in the executive. And, maybe, those people were new to the club or did not exemplify all of the traits that we wanted people to have. The decision was made to include executive members in the process of determining who would get to keep the painting for a given year. By 2004 or 2005 or whatever it was, I got the painting. The point system was abandoned because nobody wanted to do the job any more to figure out who the next recipient should be, and we can't even recall where that point system is, either. The painting was all-but forgotten about by members, who came and went, went and came. The painting kept hanging on the wall of my dining room. Al Riggs was a sales manager at Ben's Bread in Halifax for many years. He joined Toastmasters sometime in the 1980's. He was an amateur, and very talented, painter with paints as well as with pastels. I can still go to a Ben's Thrift store anywhere in the province and talk to an old-timer and drop his name. And the employee will smile and tell me an Al Riggs story. The painting was there on my wall for many years. One time I asked club members who knew what I was talking about, what to do with the painting. Should we reinstate the point system, rotate it among members? They just told me to hold on to it. It was where it should be. The family wanted us to give the painting out to a deserving member every year. We had not done that in many a year, and realistically, we never would again. It did not seem right, or fair, or just, for me to keep that painting into perpetuity. 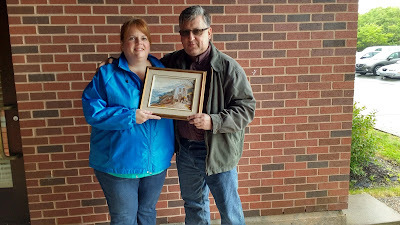 Last month, I decided to contact Al Riggs' family and offer the painting back to them. I had spoken with Al's daughter once before, back when we were giving out the painting, to see if she and other family members would like to see us give out the painting to that year's recipient. They declined, but I remembered her name. Which is weird, given how I forget names all the time. I reasoned that she would be on Facebook. She was, using a hyphenated last name which included her maiden name, so she was easy to find. I messaged her. Told her who I was and asked if she remembered me and where I was from. I took the above picture of the painting and emailed it to her. I told her what I just told you, how the painting was no longer given out, how it was hanging on my wall, and how it occurred to me that it would be her father's wish that if we were no longer giving out the painting that he might want it to go back to the family. She went away to talk to her family. Her mother, Al's wife, is still alive. 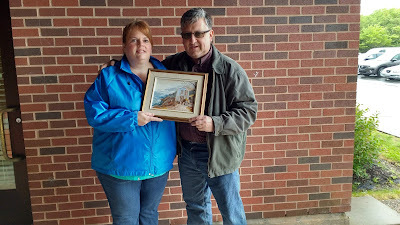 Heather told me that the family would love to have the painting back if we were not going to use it any more. She lives in Dartmouth. I'd be in Dartmouth on Saturday. I knew we'd be on break from the TM thing I was attending around 10:45, so she said she'd be there at that time for the hand off. I put the painting in the backseat of the car. It was in a bag and wrapped in a towel to protect it from the spits of rain. Two other club members were there with me. I told them what I was planning to do with the painting, and they readily agreed. The three of us went out to the parking lot around 10:45 yesterday. Heather and her husband were there waiting for us. Heather and her husband, who told me his name twice and which I have forgotten twice, told us some tales about Al. We had had the impression that Al was running around Dal Plex when he suffered a heart attack and died on the spot. We thought it was around 1986. But Heather said no, that he died in 1988. He was at home. Got up one morning and went into the kitchen, and collapsed and died then and there. They told us about the house he was building at the time of his death. It still stands and would have a studio with a lovely view to inspire his muse. His work in pastels was so good that one of his works hangs in a gallery in Toronto to this day. He was a forward-thinking guy, at one point warning his colleagues not to produce bread for other brands like Sobeys because it would diminish the Ben's brand, which it eventually did, because Ben's no longer exists, its plant closed and about to be torn down there on Pepperell Street. I can't remember the last time I saw two more grateful people. 29 years after his sudden death, Al's family gets one final piece of their father, one more memory to cherish, one more item of his that they can pass from family member to family member. With or without a points system. And it was done the day before... Father's Day. It felt good. It felt right. I don't regret the decision at all. 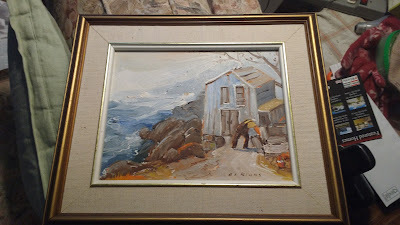 I just owe Patricia a painting of a guy bending over in front of a small home on a wind-swept day, so if you know of any, let me know.